Gooooood evening, Ladies and Gentlemen! millions on their account will be reduced. more wide). A person is some 8 pixels high (like in pak64. The 128 britain cars and horse carriages would fit as well). The details of the buildings should fit the scale. like track systems at stations are looking far better. - The bigger size of the trains allows more detailled design. - The relation between the objects is looking better. Weighing those points, I decided to go for the actual size. so divided units are not making things worse. and build everything for yourself. A bridge over a track needs 2 tiles height as minimum! - invisible loco and station, just for decoration. - train station set "Hof"
- extension and stop set "Factory"
No work has been started yet on the following objects/systems. They might come whenever graphics are available. - air: undecided, likely far later. - monorail: most likely not. - player colour: most likely not. The name "pak64.ho-scale" is not carved in stone. Whoever has a better idea, should shout. actual versions of simutrans standard. Everyone is welcome to help, critizise, praise or swear. Bug messages are highly appreciated. and the artist/author agrees in using GPLv3. is sorted in a manageable way. change or whatever. Just do it and enjoy your freedom! honour for me to contribute. regarding the non-trivial system of handling objects. Regarding object sizes, the screenshot below shows the DB E103 from pak64.german, pak128, pak192.comic and pak64.hoscale, on pak64 tracks, highest zoom. Hmm, a bug, I think - the tender constraint for the Adler locomotive is wrong, so it is unable to couple to anything. Really cool pak, I really liked the way the trains moves and do turns. The idea is really cool, keep the good work. I added it on paksets list on Portuguese and English Wikis. I've added a image gallery for your pakset. Question: Your pak have a version number? There is no number yet. The set is still in "demo status". Version numbers will appear later. For sure, this set will never be finished. Statues, other plants, fountains, petanque, a.s.o. might be included later. Below some screenshot for demonstrating some of the possibilities. A poor copy of Düsseldorf's "Königsallee"
More complexity is possible. Here a park in the typical square style of the Prussian era, but with a diagonal view through it. An old castle with it's park. One detail, I would leave more space between the trees and use two or three different models, as now imho looks repetitive. 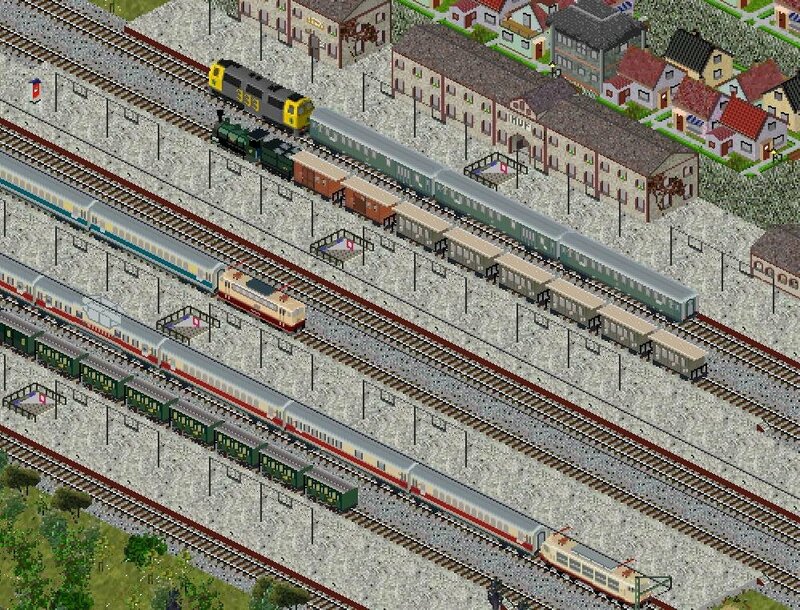 Have you ever thought why tracks at Simutrans will never break, even after 100 years of use?! I used the opportunity of the longest night of the year to find out how this is managed. All the night I controlled the game for suspicious activity. In the early morning I got them! Track workers are there! 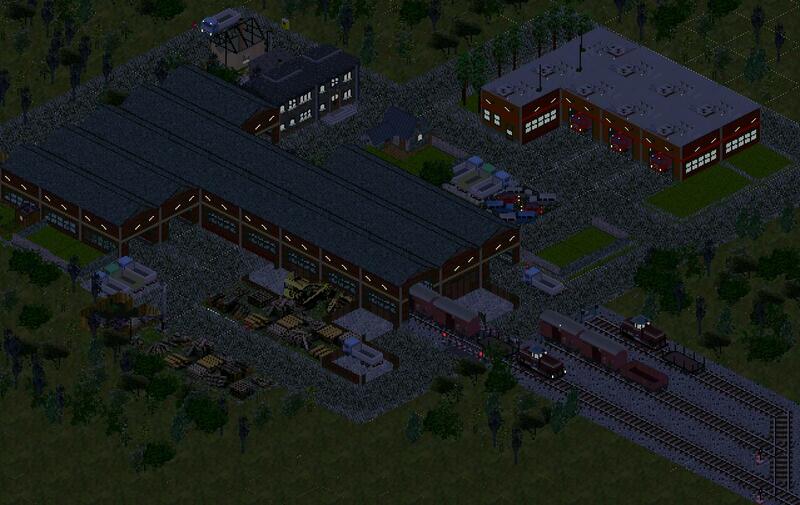 DEL building.TrackBuilder.pak, was still available by error. factory now. DEL way-object.overheadpower*, was released to early by error. ADD coaches-hannover*, dates and colours guessed. Better sources? I know: The lately published vehicles are in need of readjustment a.s.o. Will do it later. In pak64.ho-scale/ there is a demo3.4.sve, my favorite testgame for the moment. Have fun! I have to admit that I do not like the church. I have to improve it - later. Don't worry, it is still alive. Developement is going on, but slowly. Hopefully, a full version will be released by end of the year. 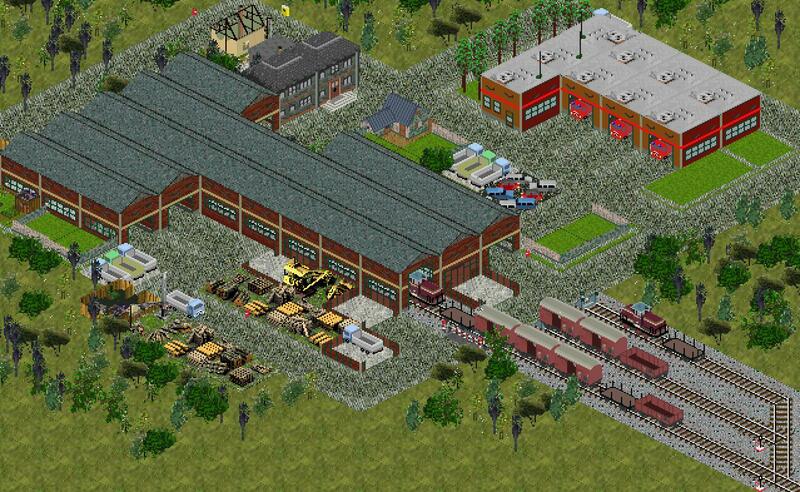 The screenshots are showing a furniture factory. They need a lot of wood. Wood tends to burn. Luckily, the fire brigade is in the neighborhood. The station must use a station extension, right, because the space left on the side of the track will not be enough for the passangers to stand. Its more realistic. Sorry, Vonjo, I don't get your point. Hey rainer! Still working on it! I look forward to download the stable soon . Would you please contact me on Jabber IRC regarding more exports of your Blender files? Hmmm... it is hard to explain. I think I should see the station first. Ok you can forget about that for now. And I might be wrong too. WOW, the picture is...just...amazing!!!! This pak should definitely be developed further. It looks so authentic. Huge compliment for you rainer! @rainer: pak64.H0-scale is my favourite pakset (except classic pak64) and I'm interested in playing it. Vehicles are so lovely and precisely drawn. I think buildings are little too dark, and there are too few houses. Still I'm waiting for any updates and I hope you won't stop your work. So tell me, where I can download newest version? Link in first post leads to old version. @rainer: pak64.H0-scale is my favourite pakset (except classic pak64) and I'm interested in playing it. There is no "new" version. I am still working on it. Most likely there will be a beta by end of the year. But I will try to publish a second playable demo within the next weeks. The Photo from the new modellslook good out. have been on duty in middle Europe from the 60ies to 80ies. far from being complete, but constantely growing - and playable. occur, they will most likely be covered by a compatibility.tab. change to public player and/or load with addons. - All objects which are belonging to the park set. for extending the "real" townhalls. - The first "slope objects". They need flattened slope tiles. Actually, it is just Well and Well2. agrees in publishing under the terms of GPLv3). - Sun and shadow is not planned, but won't disturb. - Snow versions are not necessary, but won't disturb either, I think. height. Length can be handled by Gimp. These URLs will permanently lead to the latest versions. I tried with simutrans 110.0.1, Windows 7 Pro 64 bit. So.... I tried with the never version 111.0 now and it works. This pak set looks so absolutely awesome. That's true model railroad feeling. Compliments! so your pak doesn't work with simutrans 110.0.1? Or is there something wrong on my side? It should work with all more or less actual versions. I just checked with 102.3. It starts. As the cityrules.tab is included in the right place, and this place hasn't been changed for years, I really do not know, why you get the quoted error message.